3 booster packs of Yu-Gi-Oh! TRADING CARD GAME Savage Strike, each box is guaranteed 1 of 2 Super Rare variant cards, as well as 1 of 2 Super Rare preview cards of non-foil cards from the upcoming Spring 2019 booster set! Heat things up this winter with Yu-Gi-Oh! TRADING CARD GAME Savage Strike, the first 100-card booster set of 2019! Yu-Gi-Oh! TRADING CARD GAME Cybernetic Horizon revitalized Ritual Summoning, and Yu-Gi-Oh! TRADING CARD GAME Soul Fusion created powerful Fusion Summoning strategies. Now, Yu-Gi-Oh! 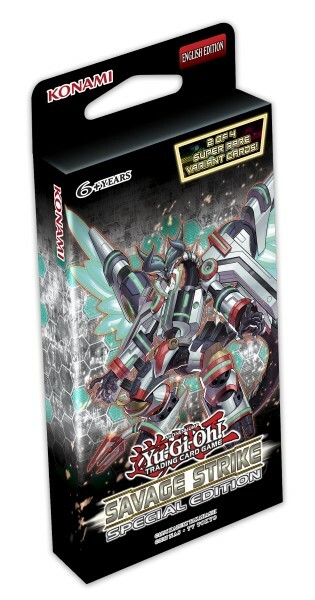 TRADING CARD GAME Savage Strike is primed to do the same for Synchro Summoning strategies! Here‘s a taste of what you‘ll be seeing when Yu-Gi-Oh! TRADING CARD GAME Savage Strike launches on January 31st. Synchro Summoning crashes into the VRAINS! Duelists closely following the simulcast of Yu-Gi-Oh! VRAINS know that Synchro Summoning has made its first appearance in the latest Yu-Gi-Oh! anime! The first Synchro Monsters from the series will make their real life debut in Yu-Gi-Oh! TRADING CARD GAME Savage Strike! This winter belongs to the undead! Following on from Yu-Gi-Oh! TRADING CARD GAME Hidden Summoners and Yu-Gi-Oh! TRADING CARD GAME Structure Deck: Zombie Horde, Yu-Gi-Oh! TRADING CARD GAME Savage Strike introduces even more Synchro-based Zombie monsters. The Shiranui theme has been inexorably linked to Zombie Decks since the original release of Shiranui Solitaire, and now it returns in force with both a new Synchro Monster and a new Link Monster that pay dividends in Zombie Synchro strategies! Elemental HERO Nebula Neos and Neo Space Connector were just the beginning! More new cards to power up Decks based on Jaden‘s Elemental HERO Neos are on their way in Yu-Gi-Oh! TRADING CARD GAME Savage Strike! You can also find the basic cards you need to build a Neos Deck in Yu-Gi-Oh! TRADING CARD GAME Battles of Legend: Relentless Revenge and Yu-Gi-Oh! TRADING CARD GAME Shadows in Valhalla. And that‘s not even half of what awaits you in Yu-Gi-Oh! TRADING CARD GAME Savage Strike! You can also find a card that annihilates your opponent‘s hand and field if they negate a Summon or the activation of a card or effect, a Spell that lets you trade part of your Extra Deck for card drawing, new „T.G.“ monsters, and more!